Is it just us, or does every holiday event suddenly cost an arm and a leg? If you want to enjoy the holiday spirit with your fam but don’t want to break the bank, check out this great list of free (or nearly free) festive events and outings. 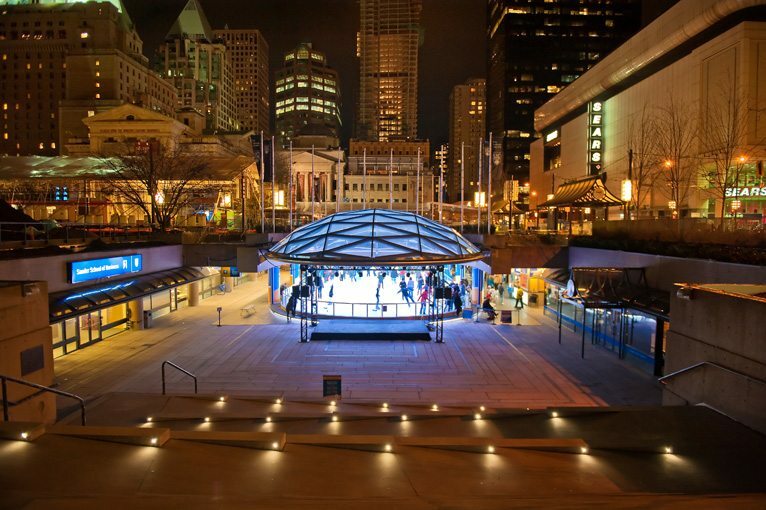 Bring the kids to downtown Vancouver’s only free winter festival. Lights and candy canes adorn lamp poles while costumed characters parade down the street. Stilt walkers and roaming holiday characters interact with revellers, to the wonderment of tots – while live music and carolling sets the stage for Yuletide cheer. This is much more than a tree lighting! It’s a full-blown family friendly festival with a stage of live performances, a holiday craft market, a fun zone with free amusement park rides, road hockey and more for the kids! Back for its 12th year, this free family friendly event takes place at Robson Square and features four magnificent holiday trees, one of which is 76 feet tall. Come for the tree lighting and stay for the live entertainment, free cookies and hot chocolate, food trucks fun for the kids. Cap the evening with a visit with Santa. Heritage holiday fun runs all month with lots of displays, sparkling light displays, décor, sing-a-longs, crafts, and even special event performances scheduled throughout the season. Admission is free at the gate, with $2.60 fee for carousel rides. Looking for free festive family fun? Head to UBC’s Wesbrook Village for their annual Holiday Celebration. They’ll have a holiday balloon display, face painting, a scavenger hunt. horse and carriage rides, carollers, Santa Claus, and more! Enjoy the charm of Kerrisdale on December weekend with strolling bands, Christmas quartets, holiday horse and carriage rides and on the 16th, the Gliding on Ice free skating event. Enjoy free holiday activities in Lower Lonsdale at the historic and super cool Shipyards District in North Van. It will be buzzing with Christmas carollers, the Grinch, elves, and the Scrooge Horns, a local group of talented saxophonists. Oh and Santa will be around as well. Floats and entertainment along historic Columbia Street! Kids can also come into Anvil Centre between 10:00 am – 1:00 pm and write and send their letters to Santa with Canada Post’s holiday helpers. Arrive early for a good spot and bundle up. CBC fans wait all year for a chance to see their favourite on-air personalities (we’re looking at you Stephen Quinn, Gloria Macarenko and Johanna Wagstaffe), meet local celebs (think David Suzuki and Christopher Gaze) and enjoy free, live entertainment from choirs to local bands and all for a good cause: raising money for BC food banks. And yes, there’s fun for the kids too from newsroom tours, a green screen at the weather station, as well as Daniel Tiger and Chirp mascots from CBC Kids in the atrium. Light Up the Night celebrates the first night of Chanukah by lighting Canada’s tallest Menorah. The kid-friendly celebration features children’s performers, free hot chocolate and special Chanukah donuts. Bring a unwrapped toy to donate to the Chanukah Toy Drive for the BC Children’s Hospital. This year’s free events include the famous Canada Place Sails of Light, an avenue of Christmas trees, and the historic Woodward’s Windows. 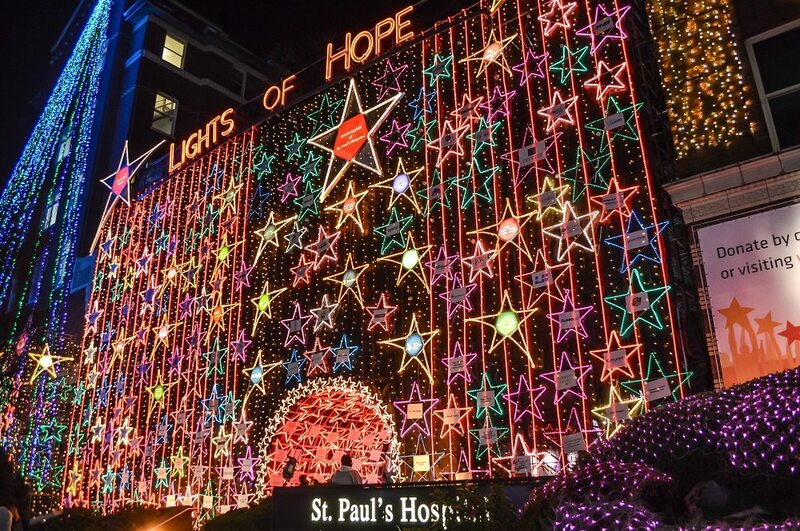 Annually, the towering wall of lights at St. Paul’s Hospital are lit. This spectacular eye-catching scene never disappoints. There’s no fee (except for optional donations you can give to support the hospital) and it’s on all season long. Free skating (with a $4 fee for skate rentals if you need them)! This is a fantastic and magical place to enjoy with the family. Skating in the square surrounded by lights and in the heart of downtown. >> Where to go for holiday skating! Coquitlam’s Lafarge Lake transforms into a magical outdoor holiday wonderland each December, and it’s all free! With 100,000 twinkling lights, Lights at Lafarge is one of the largest free holiday lights displays in the Lower Mainland. Take the Evergreen extension and get off at the last stop: Lafarge Lake-Douglas. Watch the train’s big arrival at 5:20 pm and then get ready to sing along with the Sam Roberts Band, Kelly Prescott and Tracey Brown at 5:45 pm. Decked out in thousands of lights, this train travels across Canada during the holiday season to raise food and cash donations for local food banks. Join the kids activities until 8 pm! Produced by the Secret Lantern Society, a not-for-profit organization dedicated to beauty, the Solstice Lantern Festival happens in several neighbourhoods across Vancouver at the same time. These festivals use lighted lanterns, beeswax candle labyrinths, fires and the celebration of music, song and dancing to mark the longest night of the year and the coming return of the sun. 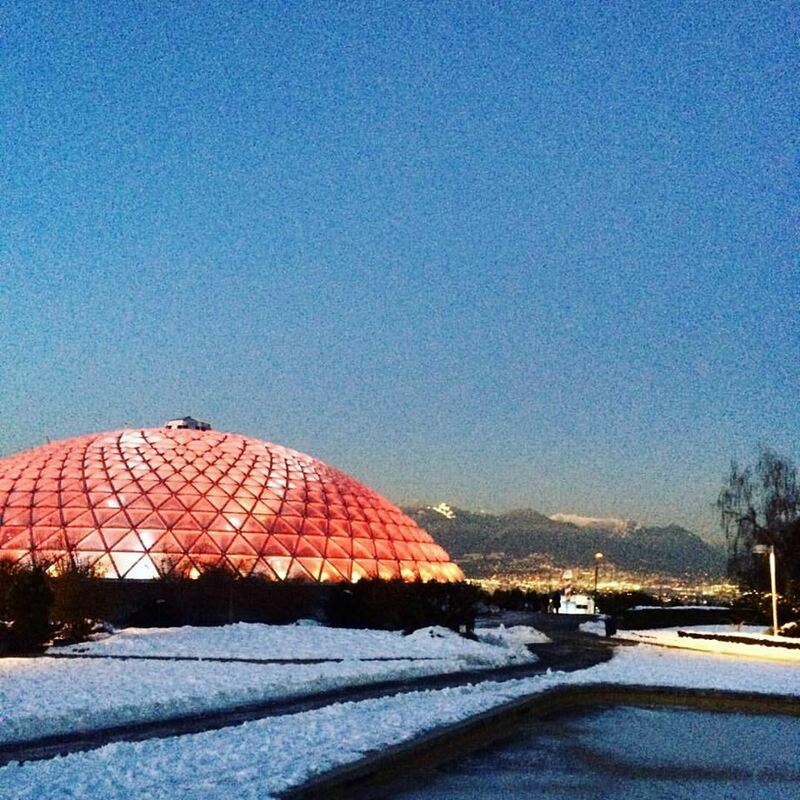 Experience a winter wonderland inside the Bloedel Conservatory with 150 free flying tropical birds, magical lights, holiday plant displays, festive music, photo ops, a scavenger hunt and much more. Enjoy the evening city views and lit fountains at Queen Elizabeth Park. During the holiday season, the Bright Nights Christmas Train and Stanley Park Train Plaza sparkle with three million twinkling lights. There is music and fun through the route and plaza. It’s not free but the matinee train is only $6 for all ages and great for kids! Previous Post The Vancouver Christmas Market is open!